There is a lot in Moana that seems quite familiar. It has the Polynesian setting of Lilo & Stitch, legendary tales depicted with crude drawings as in Hercules, a monster that hoards gold like Smaug and intelligent water like in The Abyss. It also has a giant sea goddess similar to the one in Pirates of the Caribbean, a Star Wars force ghost and an excuse for not going sailing that is right out of The Truman Show. Even the part of the film that feels the most innovative; the fact that this princess totally takes charge of her own destiny and has no prince for the purposes of romance and delivery from her unhappy life, was already done in Brave. None of this matters though as it all come together in a wonderfully engaging and highly charming movie. Following Tangled, Frozen and Zootropolis this picture confirms that Disney animation is right in the middle of another renaissance reminiscent of the one that produced The Little Mermaid, Beauty & the Beast, Aladdin and The Lion King in the late eighties and early nineties. Interestingly, Ron Clement and John Musker, the directing duo behind many of those classics from twenty plus years ago are back here, making their first computer animated film. Returning with them is a more straightforward storytelling style. 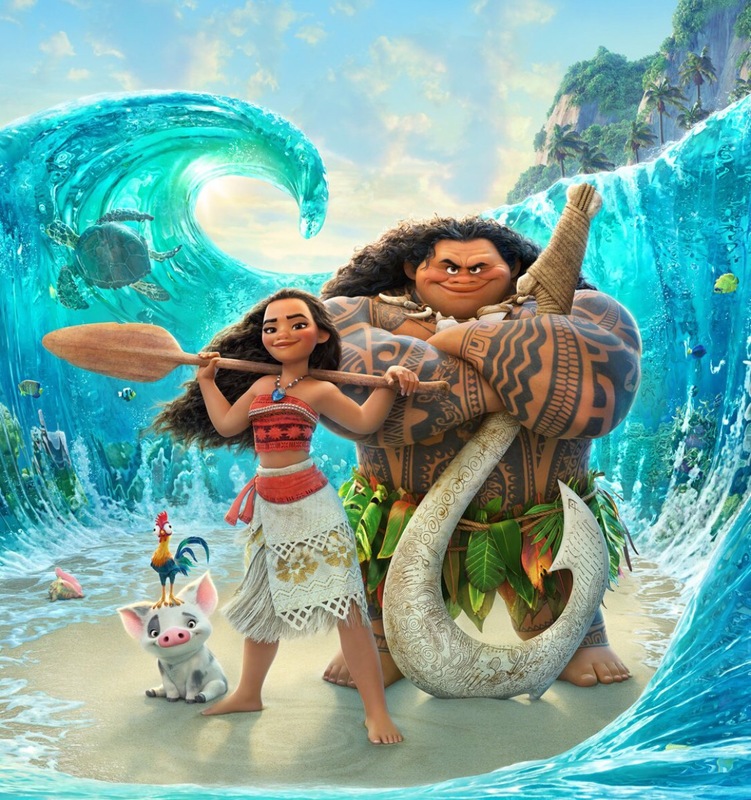 Moana is as contemporary and relevant as anything the studio have put out recently but it also feels a little more traditional in a way those other films didn’t. Disney has finally found a way to stick to the formula in a modern way. Moana’s quest brings her face to face with enemies both very big and very small and while she links up with the heroic Maui early on he is often too self serving to save the day effectively, leaving her to become the greatest cartoon feminist champion since Mulan. She’s not too skinny either which is an improvement on recent princesses (step/sashay forward Elsa). Some of the antagonists might be a little scary for very small children but no more so than anything in Wreck It Ralph or The Princess & the Frog. The cast are all strong and importantly they are also all Polynesian by decent. Dwayne Johnson’s charisma comes through in Maui’s voice performance and it turns out The Rock can sing too. Newcomer Auli’i Cravalho is excellent in the title role and this becomes all the more impressive when you know she was fourteen at the time of recording. That’s half the age Jodi Benson was when she voiced the sixteen year old Ariel. I don’t think the tunes are as catchy as those in Frozen but this may be no bad thing. The cool songwriter of that film, Book of Mormon’s Robert Lopez, has been replaced by the even more hip Lin-Manuel Miranda, creator of Hamilton. Actually though, the song Shiny has been continuously going through my head since I first heard it but it accompanies quite possible the best sequence in the movie so I have no concerns with recalling it. Disney’s Moana has arrived in cinemas just in time for Christmas. It remains to been seen if it will prove as successful as Frozen, the merchandise for which sold incredibly well both in the Christmas it was released and the one the year after. Irrelevant of its longevity though it is another brilliant new film from a studio that currently seems most focussed on repackaging its back catalogue. Don’t wait for this one to come out in live action though, see it now. It’s hard to see how it could be better.